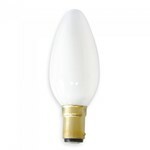 28W halogen candle bulb with an SBC base - perfect for chandeliers and sconces and with an extra 30% energy saving compared to standard halogen bulbs. 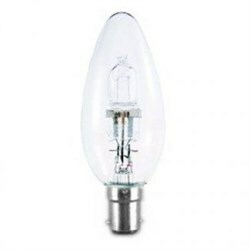 A high-quality halogen 28W halogen candle bulb from UK firm Bell Lighting that is an energy-saving replacement for a 40W incandescent candle bulb. This is a clear version and is from Bell's Energy Saving Classic range, which provides an extra 30% energy saving compared to standard halogen bulbs and is fully dimmable. It has an SBC base (Small Bayonet Cap, or sometimes described as B15d ) and will last for 2,000 hours. It gives a warm white sparkle and is perfect for chandeliers and sconces. For a more gentle light, choose our 18W versions of the same bulb. Candle halogen bulbs from Bell Lighting are used extensively in both domestic and commercial settings. They are ultra-reliable, using superior components compared to the very cheap and flimsy-feeling halogen bulbs offered in supermarkets and discount retailers. We test the products we sell extensively and monitor returns rates - Bell halogen bulbs have a returns rate of less than 1%. Offered here at Ryness.co.uk with a Price Promise - we check our prices every day and are confident that you can't buy better online. We also have huge stocks and can fulfill next day orders for hundreds of units. 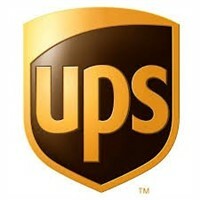 We can even offer same day delivery in London and within the M25. Please call our helpful customer service team for assistance.